Three Murder Mystery formats including Children's Parties. All types of venue, even your own home for private parties. Private Murder Mysteries including Hen and Birthday Parties from £325. Corporate events and parties from £500. Catering options for hen parties and birthday parties from £12.50 p.p. All aspects of your event covered by swift, friendly, professional service. Our team of actors are hand picked for their improvisation skills and sense of humour, which makes STICKY ENDINGS first choice for an murder mystery evening out with a difference, a hen party, birthday party, special occasion or corporate event. Murder Mystery scripts vary from our most popular 1920s great Gatsby style romp to futuristic time travel, spooky seance and other themes. 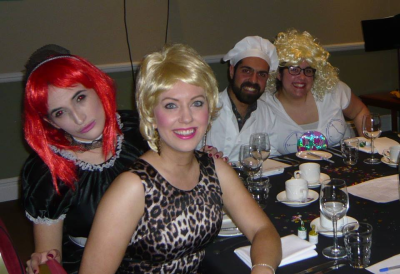 Fancy dress, formal or casual, there is a murder mystery script to suit your guests. The emphasis is on fun and intriguing scripts which are original and challenging. For private murder mystery events we can find your ideal venue or perform at your own home or local pub! Our wide choice of plots serve up a perfect blend of laughter, mystery and surprises with the emphasis on having a good time. We can even provide catering, recommend venues and organise the event to your requirements, all at a cost to suit your budget. Private parties start at just £325 for our tailor made plots, ideal for hen parties and birthday parties etc. Based in Oxford, we have been providing fun and exciting murderous entertainment with our high quality interactive Murder Mystery dinners, parties and events in Banbury, Bath, Bicester, Birmingham, Cheltenham, Coventry, High Wycombe, London, Milton Keynes, Monmouth, Norfolk, Northampton, Oxford, Peterborough, Reading, Slough, Stratford, Swindon, Thame, Warwick, Windsor and York. We can transport our daggers, guns and body bags to all parts of the U.K. too. Just ask!